It's important to know what you're getting yourself into before investing in bank stocks. There's more than one type of bank stock to choose from. Image source: Stockbyte/Thinkstock. If you want to invest in bank stocks, you first need to know what type of banks match your investment objectives. By my count, there are five types, with each offering benefits and detriments from the perspective of an individual shareholder. The biggest banks in the America are universal banks. JPMorgan Chase (NYSE:JPM), Bank of America (NYSE:BAC), and Citigroup (NYSE:C) all fall into this category. The biggest benefit to a universal bank from an investor's perspective is that they're diversified across multiple business lines and a wide range of geography. This helps banks like JPMorgan Chase, Bank of America, and Citigroup offset the negative impact from, say, an unexpected change in interest rates. In terms of geography, moreover, history speaks clearly to the benefit of a wider reach. Virtually every major bank in Texas failed in the 1980s due to overconcentration in the then-ailing energy sector. Meanwhile, although oil prices are tracing a similar path today, the energy industry is just one of many that JPMorgan Chase, Bank of America, and Citigroup lend money to around the world. Conversely, the biggest downside to investing in a universal bank is that new regulatory rules require them to hold more capital relative to their assets than their smaller, simpler peers. This reduces leverage and depresses profitability -- though it remains to be seen whether the latter will be offset by these enormous banks' economies of scale. The heightened capital requirements for "too big to fail" banks is a consequence of the financial crisis, during which the federal government had to pump $800 billion into Bank of America and Citigroup alone in the form of cash and government guarantees to ensure they didn't fail. By requiring the nation's biggest banks to hold more capital, the belief is that they'll be able to survive a future severe economic downturn without going hat in hand to taxpayers. A traditional bank does what most people think banks do -- accept deposits and make loans. Wells Fargo (NYSE:WFC), U.S. Bancorp (NYSE:USB), and M&T Bank (NYSE:MTB) are prominent lenders in this category. While traditional banks tend to be smaller than universal banks -- Wells Fargo being an exception, as it's about to pass Citigroup to become the third biggest bank in America -- they make up the majority of the industry. Of the nation's 6,270 banks, only 110, or 1.8%, have more than $10 billion in assets on their balance sheets. And most (5,564) have less than $1 billion. Traditional banks earn the majority of their revenue from interest rate arbitrage. In the first nine months of 2015, 61% of Buffalo, New York-based M&T Bank's top line came from net interest income. JPMorgan Chase, by contrast, earned less than 46% of its net revenue from arbitraging interest rates; the rest came from fee-based businesses such as investment banking and wealth management. Paradoxically, even though traditional banks aren't as diversified as universal banks, the best among them have generated the industry's highest shareholder returns over the past 30-plus years. Since 1990, for instance, Wells Fargo and U.S. Bancorp have convincingly blown away their counterparts in the universal banking space, as you can see in the chart below. The two principal downsides to investing in traditional banks are that, as already mentioned, they're less diversified than universal banks, and they tend to be less efficient because they don't get as of a boost from economies of scale. The typical traditional bank with less than $100 million in assets spends more than 80% of its net revenue on operating expenses, compared to only 62% for the average $10-plus billion bank, according to FDIC data. Importantly, Wells Fargo and U.S. Bancorp are exceptions to this. Both of these banks run notoriously lean operations, with efficiency ratios that have historically trended toward 50%. The significance of this can't be overstated, as the efficiency ratio is arguably the single most important metric when it comes to identifying great bank stocks. Publicly traded investment banks are somewhat of a misnomer in the aftermath of the financial crisis, as few emerged as independent, stand-alone entities. One that did is Lazard (NYSE:LAZ), a $4.1 billion firm that specializes in advisory work and asset management. The two others, Goldman Sachs (NYSE:GS) and Morgan Stanley (NYSE:MS), survived only by converting to bank holding companies. This gave them access to the Federal Reserve's discount window, pre-empting likely liquidity crises at both. But it also means that the storied Wall Street firms have as much in common with universal lenders as they do with pure-play investment banks. This nuance aside, the benefit of investing in firms like Goldman Sachs and Morgan Stanley (and Lazard) is that they expose your portfolio to some of the best and brightest minds on Wall Street, if not across America. The detriment is that they do so without the offsetting diversification of a universal bank, which counterbalances its investment banking business with consumer and commercial lending. The fourth type of bank is the most mercurial -- custodial banks, such as The Bank of New York Mellon (NYSE:BK), State Street (NYSE:STT), and Northern Trust (NASDAQ:NTRS). These banks provide the infrastructure for America's capital markets. They stand between institutional investors such as pension funds, sovereign wealth funds, and university endowments on the one hand and the universal banks that manufacture and distribute fixed-income securities and derivatives on the other. You've probably heard of mortgage-backed securities at some point over the last decade -- I presume this only because they played a central role in the financial crisis. These represent ownership interests in trusts that hold thousands of mortgages, giving the securities' owners a share of the income generated from the home loans. But while mortgage originators generally create these trusts, someone needs to administer them -- to act as their legal representative, pay their taxes if necessary, and make sure their beneficiaries (the securities' owners) get what they're contractually entitled to. This is what custodian banks like The Bank of New York Mellon and State Street do. What's particularly interesting about these two banks is that you'd never know the extent of their role in the global financial system merely by looking at their balance sheets, which rank among regional banks in terms of size. For instance, U.S. Bancorp most recently weighed in at $416 billion in assets, while The Bank of New York Mellon and State Street came in at only $377 billion and $247 billion, respectively. The difference is that most of the assets administered by custodial banks aren't on their balance sheets, but are instead classified as assets under custody or management. The Bank of New York Mellon oversaw $28.5 trillion worth of such assets for clients as of the end of the third quarter 2015, while Boston-based State Street had $27.7 trillion. This is why the CEOs of both firms were among the dozen financial executives that worked alongside government policy makers at the nadir of the financial crisis. It's also why they're both classified for regulatory purposes as systematically important financial institutions. The benefit to owning shares of these banks -- as Warren Buffett's Berkshire Hathaway does in the case of The Bank of New York Mellon -- is that the barriers to enter their field are insurmountable for all but a few of the biggest financial companies in the world. This presumably should help them protect their margins and generate above average profitability over an extended period of time. The detriment, however, is that, like investment banks, they offer little diversification that could help offset a decline or temporary setback in their primary business lines. They're also, like the biggest universal banks, subject to elevated capital requirements compared to run-of-the-mill traditional lenders. The final type of bank that you can invest in consists of a hodgepodge of niche lenders -- banks like New York Community Bancorp (NYSE:NYCB) and SVB Financial Group (NASDAQ:SIVB), the parent company of Silicon Valley Bank. Superficially, these banks resemble traditional lenders. But the difference is that they concentrate in specific industries. New York Community Bancorp specializes in financing rent-controlled multifamily apartment complexes in the New York City metropolitan area. SIVB Financial Group provides financial services to start-up companies in and around San Francisco, California. 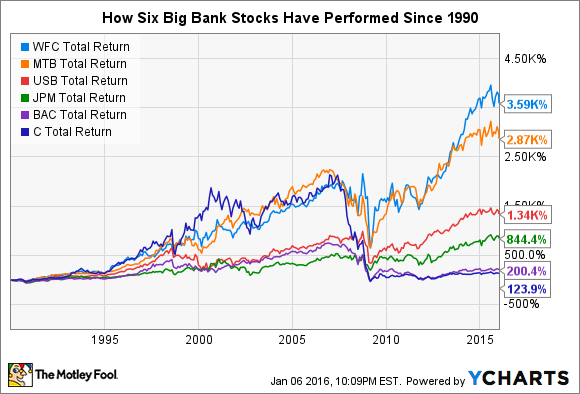 Both models have worked well for these banks in the past, with New York Community Bancorp in particular ranking among the best-performing bank stocks of the past quarter century. Its biggest competitive advantage is its pristine record of risk management. Because the buildings that collateralize its loans are rent-controlled, and thus almost always 100% occupied even in the worst of economic times, its borrowers rarely default. While the average bank charged off 2.9% of its loan portfolio in 2010, New York Community Bancorp's net charge-off ratio crested at a mere 0.2%. The problem in New York Community Bancorp's case, however, is that it recently announced a merger with a more traditional lender that could dilute this advantage. Moreover, because its merger partner, Astoria Financial (NYSE:AF), outsources much of its credit risk to third-party mortgage originators, as discussed at length here and here, it opens up the possibility that New York Community Bancorp's history of outstanding risk management could be in jeopardy. Either way, the detriment associated with owning shares of New York Community Bancorp and SIVB Financial Group is that they will rise and fall with the industries they cater to -- multifamily real estate in the former's case and technology in the latter's. To be clear, neither of these are necessarily bad investments; they're just potentially less resilient than, say, a universal bank like JPMorgan Chase or Wells Fargo.